I have heard myself speak. I have listened when you speak. 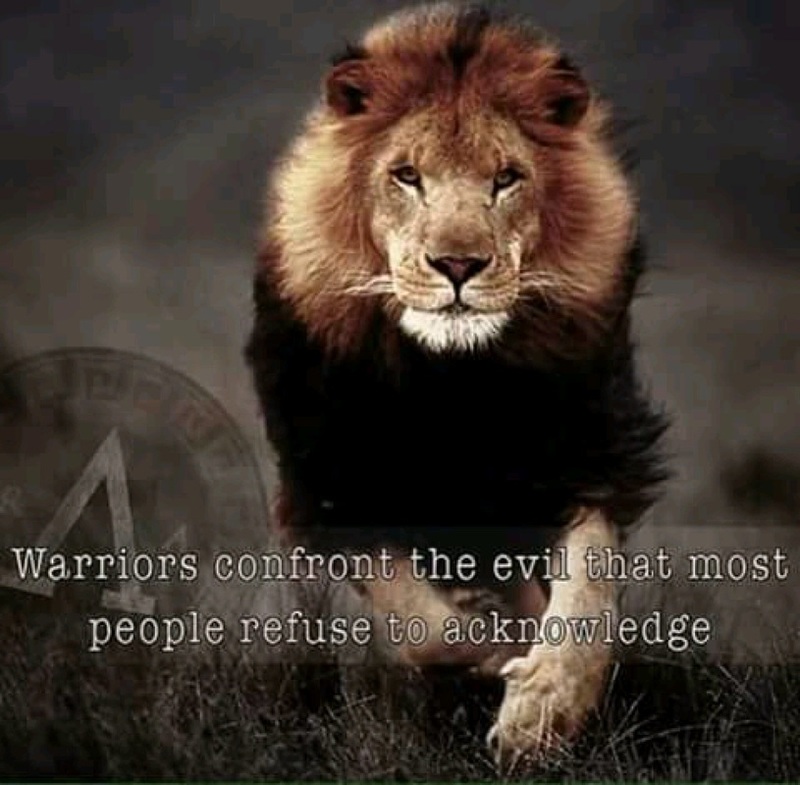 I hear so many everyday talk of what they are powerless over. I hear my own internal voices regularly define why I can't do something. There is always a very real and valid reason behind these statements. It is easy to believe that our choices are limited by our circumstances. Our beliefs are generally created by our experiences. It has taken me many years sitting with this one question.... What if our beliefs are now creating our experiences? I struggle with this idea, as beliefs I have held to be true are continuing to be reinforced by the things I see occurring in my life. I know that life can be different, but have often fallen back on words I was conditioned to believe. That while this is true for most people, it doesn't apply to me. I should accept this and my life would be happier. I need to be grateful that I have anything. My life story does reinforce an innate thankfulness for simple things. Times of lacking basic human needs, have allowed me to know that food clothing and shelter ought not be taken for granted. Financial crisis and not having a place to call home, developed within me a joy in paying bills every month. Facing death has gifted me with gratitude for the very breath I breathe. Betrayal and abuse in relationships, has blessed me with faithful loyalty in trusted relationships. Just because I am thankful for these things in my life, does not mean I don't wonder if life can still be more than it is. What will I do with the blessings in my life? Will a quiet mediocre existence be accepted as all there is for my life? Is 'better than it was', my new limit? I have spent years believing that. Yet, each step forward has also held a restless almost discontented continuation of questioning my new self imposed limitations. I've been told I analyze things too much, but it's only by these hard questions that I'm able to see where and why I'm not thriving. I find what I believe is preventing forward motion, identify it, and pray about it while asking if my belief about it is actually true or not. Over and over, I find the gift of freedom increases when I see that I have a choice. Is it health, busyness, finances, stress, time, other people's problems, hating your job, lack of education, addictions, housing, your past, unhealthy relationships, struggling to survive, lack of fun, mental problems..... What do you believe would have to change before you feel like you can live your life? What are you believing about this thing that is causing it to hold you back from the life you want? Lets keep the conversation going, share your thoughts. Who Do You See When Seeing a Human? ​Who Do You See When Seeing a Human? 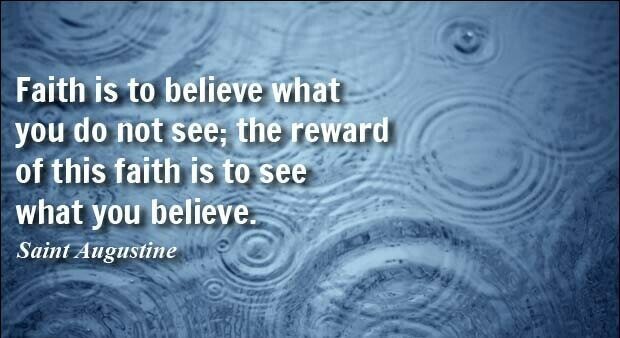 Faith is believing we will see what God says to be true, no matter what we see beforehand. In years gone by, I would have claimed that my faith was strong. What I didn't know was really just how much I didn't know. The things that I had firmly placed my faith in, contained many falsehoods of things I had learned along the way and had become fully convinced were true. Things I had grown to believe about God, myself, people I knew, and my own perceptions were skewed to such a degree, that at times I had no idea whether anything or anyone could be trusted. That remained true for the greater portions of the life I've experienced thus far, until someone came into my life and relentlessly questioned why I believed something and whether my belief was what God said to be true. I wriggled and squirmed, argued incessantly, pushed back, and even tried to proved God wrong. In the end, my denial began to grow into awareness. A slow progression of truth replacing the false beliefs I'd grown accustom to living with. This friend, had never tried to convince me of anything but continued to bring me to the edge of truth with questions that I needed to answer for myself. And in my search for answers, Truth faithfully showed up. In the places that I was no where near trustworthy, she chose to trust and speak as if it were already true. In moments that I was not very loving, she spoke of the love God had placed inside of me. In the midst of destructive acting out, she spoke of my gentle and compassionate heart. In my selfishness, she welcomed my generosity and kindness. In my own certainty that I was insane, she spoke of my sound mind and repeatedly reminded me that I'd been given the mind of Christ. Continually reinforcing that because the Spirit of the Most High God lives within me, the fruit of love, joy, peace, patience, kindness, goodness, faithfulness, gentleness, and self-control were already within me. She believed what God had to say about me, well before these things were very evident in my life. She saw only who God said I am, and because of this, I came to believe God was right about me. ​A very long season of life began to fade away. God began filling my mind with truth and setting it deep within my heart by creating artwork with God during the process. This process of creating filled me with joy and began a steady influx of things that became certain in me. I questioned less and less of what was true and what was false, and began to believe God more often than questioning His word. My faithful and loyal friend, Bethany Looyenga, has continued to be a strong presence in my life. I have enjoyed being a part of the ministry she founded and leads, Agape Celebration, as well as shining out as a light to the nations through Rooted in Mercy. I've had an absolute blast participating in Agape's retreats, and it is a joy to my heart to see Rapha Art groups begin also. Another branch of Agape Celebration's ministry is called Restoration Meals, my family was helped greatly during times of medical crisis so I know firsthand how valuable this is also. Over the past few years, I've been slowly exposed to healthier eating, and this year began doing The Daniel Plan with a group of people through Agape also. My desire to find a happier and healthier life for my family began a pursuit into a new direction too. I began to learn a lot about essential oils. At first this was almost all about finding a path of wellness for my kids, but my own experiences and research brought me to a place of seeing for myself. Guess what? God was right yet again. Eating healthy and adding essential oils to my journey of wellness, brought a startling positive change. I have become an essential oil independent distributor for a company called Young Living, after much research, visiting one of the farms and knowing that it was a company built on integrity and trust. My family began experiencing positive results and my desire to share this with people I cared about, grew rapidly. At first my thoughts were just about doing it enough to not be paying out of pocket for the oils my family enjoyed using, but it became evident as we began using some of the supplements and cleaning products, that this was definitely something to share with the world. There is so much more I could get in to about this journey but if you are anything like me, you'll have to question and experiment and research for yourself. I have a great desire to give back to Agape Celebration all that I can, for the gift of love and dedication shown to God, by constantly filling my life with truth and always always bringing out what God can and will do in a human life who chooses to believe Him first. Then click on the top righthand side "Become a member"
Scroll down and Choose "I was referred by a member and have their ID numbers"
Let us know if you've decided you'd like to join us, but need any assistance, or if you have any questions at all. I'm excited to hear what freedom you may find along the way! My first baby step toward freedom, was recognizing that I didn't have to stay stuck, in the life I was living, that God really did have better things in mind. Today's blog post might be slightly more antagonistic than I actually intend it to be, but I think about many things everyday and how they affect life and sometimes I am truly left with more questions than answers. I titled this "What's wrong?" because I find this question to be completely irritating, if I am to be honest here. The scenarios in which this question seems to pop up the most are those in which it appears that the person asking is uncomfortable in the manner in which something is being expressed in another human being. Sometimes it is the result of a facial expression, or tears, or really any outwardly observable action. Suddenly bringing the question asker to the awareness that they might be lacking a piece of information because their current response to the moment at hand is different than the other person's expression, which is immediately labeled as wrong. Why do we approach people like this? Everyone could probably come up with something in their lives that is not currently going perfectly and commence the retelling of all of that. Or they could immediately correct whatever caused the outward alarm and try to be convincing that all is well. But, I'm wondering why we insist on cornering people into either lying, or retelling all the negative, often to follow that up with some sort of cliche of seeing the positive and keeping their head up. So we ask people for their negatives and then become critical at how negative they are, when they were not even speaking in the first place. I've been watching a phenomena for a really long time. I've noticed it mostly in regard to how uncomfortable people become around emotions or life issues that don't have a clean cut resolve in solution or direction or are simply long and drawn out or painful, people would just prefer to not be exposed to them. There is not a place of simple response and move on. If they can't fix it they'd rather not have to look at it and remember that we live in a broken world. If a person is crying, we will do whatever it takes in the moment, just to get them to stop. We may ask what's wrong, but is our intent to fix it, or to listen, or to understand? I'm not a huge fan of crying around other people, but I'm discovering it's more because of how much I dislike this question than how much I dislike crying. Maybe tears are more about what is being made right by allowing them, than about what is wrong. We live in this funny little world, where people speak words like "Be yourself" and "Be Vulnerable" and repeatedly tell other people how important it is to be "real". I hear of things like a safe place of community where people are open and honest with each other. I watch how we all share our best faces with each other, how we openly share things after we have victory over them. We expose struggle as if its some foreign language that no one can understand. We share on Facebook our finished project, our finest moments, our favorite things, and people think they know us. They know our shiny side, but not the 50 failed attempts that got there. Not the long painful process of becoming. We as a society have no value for weakness. Only our strength is held in public view. I was raised to get up and keep on no matter what. And I've paid a high price for the stubbornness of my own persistence. Yes determination and perseverance do have merit, but they really are not a place of boasting. They create weakness also. How does God's strength become revealed, if we only speak hope. If tears are never seen or weakness never noticed, is it only after all is made well that God is glorified? I wonder sometimes between the Psalmest David, and the writings of Paul, if there is something different to be seen. 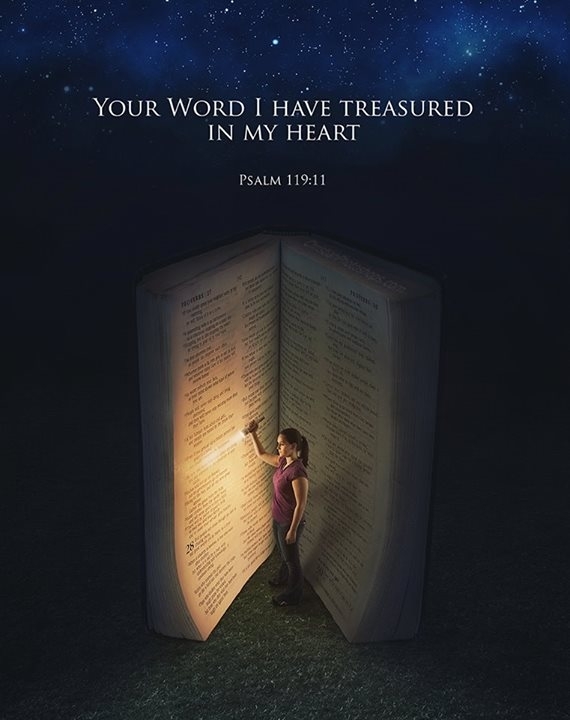 The Psalms are riddled with whining and complaining and insistence that God do something about all this mess, yet nearly always end with praise and gratitude for God's faithfulness and love. Paul just affirms that whatever it is God's got a grip on it, but still clarifies his circumstances lest anyone forget that they've got nothing to complain about, but to be glad in. Neither of these guys spend anytime at all being silent about what's really going on around, but also speak of what God is doing in them to keep them right. What would be so wrong with simply changing the game by changing the question. ​I see God is making something right, do you want to talk about it? I often wonder what would happen in life if we didn't feel the need to have societal experiments rigged toward cultivating fear. The quote above suggests that eliminating fear as the end result of such experiments, would simply be found in understanding. 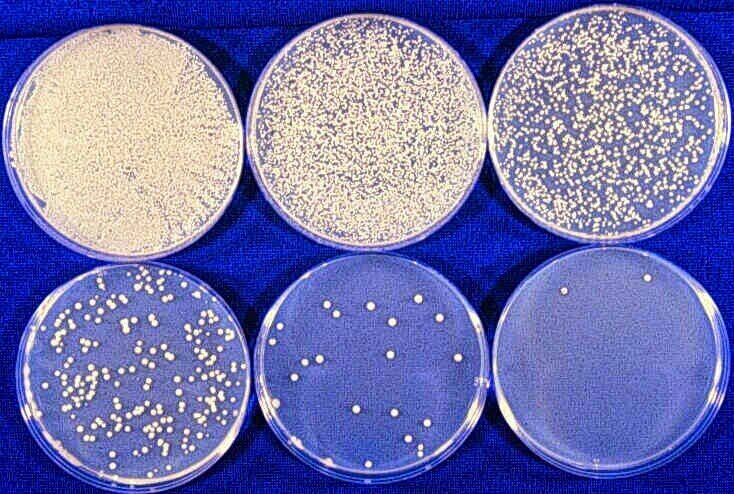 What I find surpising is how many people would prefer to grow fear in the petri dish, than would be willing to examine the evidence in an unbiased manner. When we look through a microscope at human existence and focus only on the one thing we are looking for, in time that is all we'll ever see. I've spent many years pondering the point of labels. Wondering what is gained and what is lost. Some labels provide necessary and information, like food labels for example. I wouldn't want to open a can while cooking something, to find it's contents surprising. But labels on human beings can help bring clarity or confusion. To segregate classrooms by catagorizing children into age groups, labels them but also allows for them to be treated appropriately. Labeling by gender also can be helpful, as opposed to labeling them by something like race or ethnicity. As adults there are reasonable labels that are descriptive, like defining a line of work someone does. Oddly even that begins to build a stereotype in people's minds. We can label people with traits of physical nature or of the character we see them display, or hundreds of other areas. I wrestle with whether any of this is a good thing. What if we begin to label people openly with their habits or their past, are these concrete things? What if we could see what is really inside people, would those labels be different? Do you think that knowing more of what is in a person would cause you to see more positive in them, or more negative? What if we all wore signs around listing all the labels that have been stuck to us or that we've picked up ourselves? I don't think any of us would be free from all that. So what happens is that hiding and shame grow in the dark where these labels have been attached and judged. When a mistake of the past creates judgment over a future, or a misunderstood diagnosis changes how a person is treated, when your very identity is questioned by people who know the labels but don't know you, what then? Is the answer fear or ignoring the problem with all this? What do we do with this shame driven culture we've created? What do we do as loving human beings when we see this behavior among those claiming love and acceptance of differences? Is one voice in the masses going to change anything? I know one thing for sure, Silence will continue the issue. My one voice, instead of hiding and pulling away into a place of darkness, will at least make a change in me. Any that know me, know I have a messy past. Laced with struggles, victories and moments of complete defeat. This created piles of labels. I have worked very hard at cleaning up my own wreckage. Because of many things that weren't exactly my doing, I still have labels over my life. I have medical diagnoses, and psychiatric diagnoses, and I'm short, and I'm female, and I'm a mom, and I'm a wife, and I'm an artist, and I'm in recovery, and I'm a math nerd, and I'm a janitor, and I'm a friend, and I'm a sister, daughter, aunt, niece, I'm an American citizen, I literally could list hundreds of labels. I am a child of God. I choose to follow the path He leads me down. I'm completely loved by Him. So i don't have to fear. I'm completely accepted by Him. So I have nothing to prove. I find it very disheartening at times though, when one of these labels is taken up and held against me. I have no need to defend any of it, but it does draw reason to keep secrets and not live out the freedom God has given me. Where do we really stand when it comes to saying a person cannot serve God because of certain places of brokenness in their lives? Granted I'm not fond of rejection, but I understand that it's not mine. If rejection comes over a label that someone is unwilling to understand, then they are simply rejecting their misconceptions based in some other experience, not having anything to do with me. I've watched hundreds of people though, take on these places of rejection and lose life over it. So are we going to continue judging and stigmatizing and shaming people to death, or is healing found amongst acceptance, tolerance of differences, grace, and compassion. All of us live with some brokenness in our lives, but the expectation to keep it to ourselves and never let anyone in, is not the way God designed people to be. We are created for relationship with God and each other and these relationships are where healing the brokenness is found. Please love each other as if it were yourself. Assume everyone to have hardship and struggle, walk with empathy and compassion. I won't be shamed into Silence. Even if no one understands, I know within myself that i stand. I stand up with any who are pushed around by adversaries of fear and shame and anger and misunderstanding and hopelessness, we choose to be victors not victims. It never ceases to amaze me, when a simple project turns into a thought provoking life lesson. 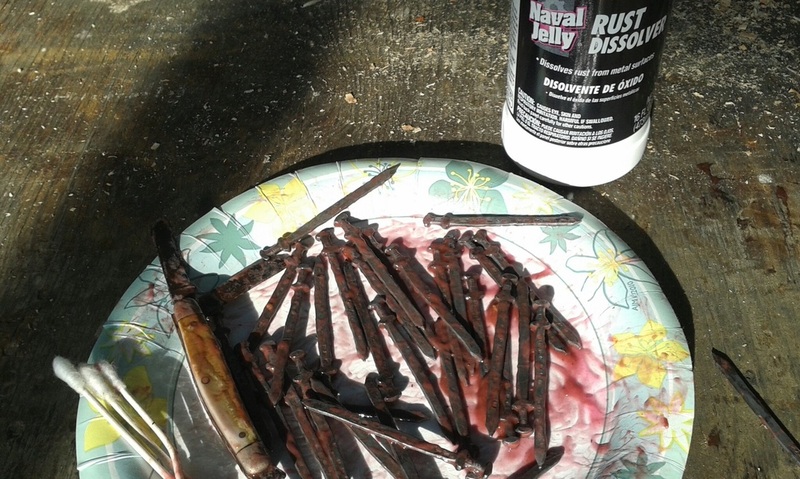 As the picture above shows, this one is about rust removal. I'm finding that even following the very specific instructions, this is not as simple as it seemed. Which in turn gives me plenty of time to think about it. This scripture keeps coming to mind, so I figured I ought to pause and write this down. I'm prone to forgetting if I just carry on. This project I'm working on began many months ago, and as winter came, I decided to store it until warmer weather made working outside more pleasant. I'm quite aware that my idea of storing something I treasure, was not well thought out. As the dampness came, so began the rust. As I think about at this and how I treat things and people that matter to me, I find that the way I treasure them often falls short of my desire for their well-being. My perspective gets skewed by distractions entering in, and I forget how I want to treasure them. When my thoughts remained fixed on a more firmly planted kingdom perspective. I'm able to see past the immediate moment and respond with a long term intention in my own actions and feelings. My treasures belong to God and I very much desire to treat them with that kind of care and love. I begin to focus on their treasure in a heavenly places and watch my own heart change. When my treasures are stored in heaven, my desires also shift. It is no longer about me and what I want, but about God's goodness in what He wants for all of us. Today I no longer want to see the rust and the moths, the thief coming to steal what God freely gives, today I can choose to not invite the thieves in, and all the while thank God for His rust remover that works better than mine. Some of you may already understand the topic of this blog, to others it might make sense of what didn't before, and the rest may just say this is too long to read all the way and I wasn't asking in the first place. Regardless of which category you are in, time has come to explain some of what we are up to and why, simply to clarify the point again. 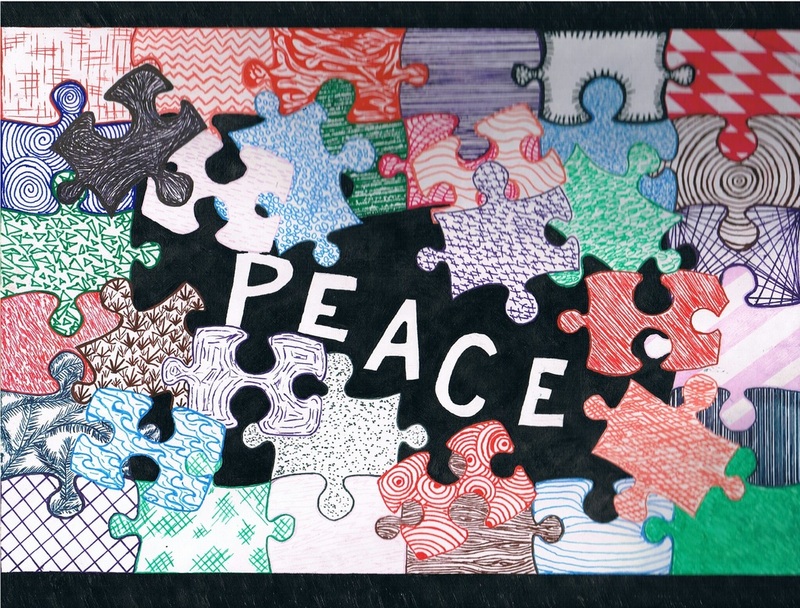 Peace in the Pieces was originally founded in a desire to continue something that was already occurring. In a time of life that things being created were being seen, shared, and enjoyed by other people brought an increasing number of requests to make things. This was very enjoyable but began to strain the family budget more than I could justify. At the place of decision, a strange thing came into existence. A piece of artwork was commissioned with minimal guidelines as to what it should be, it was created and purchased, thus beginning the process of imagining that this could become self supporting. Art has not always been high on my list of priorities. For the majority of adult life it wasn't even something I desired to do, and I firmly believed it wasn't a skill I possessed, best left to the creative artsy crafty people. I'd stick with more rational logical things like numbers and fixing things. Through time I've recognized that I've always been creating something in some way. Over the last couple years some of this has been shared more openly with other people, very slowly. Mostly because what I was creating was for my own growth. It wasn't being done for other people. It was simply my way of understanding the world we live in. This question for me almost holds more mystery than answers, and can only be explained by a long story, that any of you who know my family has already heard a hundred times. In April of last year my daughter got sick. Within a very few days it became abundantly clear that it wasn't just a normal sick. To make a painfully long 5 week story much shorter, I'll simply say that within a week medical tests and increased symptoms grew to at least every other day. By the end of 5 weeks her pain was so excruciating that she was in bed almost constantly. Her vision was failing to the point that she was no longer able to read. Her ears turned every noise into pain. She became unstable to the point that she could no longer walk unaided. The pain was so acute that we could not even hug her. From a mother's perspective it was the hardest thing in the world to push her toward painful medical tests that only ruled things out but never led to an accurate treatable diagnosis. I know that 5 weeks does not sound like a long time but it felt like eternity. We were running out of ideas and she was continuing to get worse. Waiting time to see specialists just wasn't going by quick enough. We had to find another way. With desperation at an all time high, we fervently prayed for a new idea, something, anything to try. The doctors had resigned to the waiting on specialists to have appointments available, but this was not their kid or where they lived on a daily basis. We made a decision to drive her to northern California, to a healing rooms at a church in Redding. We had heard miraculous stories of things happening there and we needed a miracle badly. The night we got there we attended a church service. She was prayed for but remained significantly worse from the long travel. Hope was hard to hold on to. We went to the healing rooms the following morning as soon as they opened. Through the duration of the day things began to change. The how was truly unexpected and unexplainable. In the middle of a large room there were art easels set up with people painting, there was music being played on the stage, there were people dancing with worship flags, and all sorts of things happening that were not in my typical experience of church. It truly was a place for me of seeing things I'd never seen before. My daughter was invited to paint which apparently isn't typical even in this setting, but as she did, her feet became steady under her. I'm not going to detail out the entire day, but the afternoon also included painting when all of us were invited to participate in what was called an art sozo. By the end of the day my daughter was 100% healthy. I cannot explain why art. All I know is that in one day everything changed. Had I not seen this with my own eyes, my own skeptical nature would likely try to find some sort of more logical thought. One doesn't exist, my daughter was healed by God through art. My daughter left her first painting there, we didn't understand why until later. In researching stories of other people healed in a similar manner, we came across a very strange phenomenon. There are a myriad of similar stories to hers with additional details of other people being healed of the same malady that was healed just by seeing the painting made during the process. This changed my own thoughts on sharing artwork with other people. This intriguing new knowledge left no room to claim that other people have nothing to gain in seeing what was being made during my own learning and growth process. I began to understand that just as I am created in the image of God, that I am creative by that very nature. That in acts of creating art I'm becoming more like who I am. In stepping into this I've been just as surprised as many of the people around me that I have been given a gift in this area. I have no formal art training or schooling but a God given ability. God shows me new things in each piece of art that is made. Art continues to be made and shared. Which brings me much joy, but there is more. This journey of understanding why it matters has grown a passion in my heart to help other people see a bigger God. The beginning of my daughter's healing was simply painting during a time of worship. My previous life experience confined acts of worship to singing songs. My small God box was shattered forever, by understanding that there is so very much I've missed out on in keeping God single-faceted. There has been a growing intentionality in much of this that has finally matured enough to bare fruit. Over the last four months good ideas have become plans. Plans have been revised several times but the intention had never shifted. I'm not doing any of this with ideas of financial gain or noteriety. I could care less if my name is ever known. My intention is simply to share with other people what I've found. The unfathomable love of God that is bigger than I could ever imagine, and the freedom and joy that can be found outside of the safely contained box sized God. We designed and built a prototype of a narrow transportable two sided art easel a while back and as finances allowed began putting together a systematic way for up to twenty people at a time to participate in a time of worship in art form. 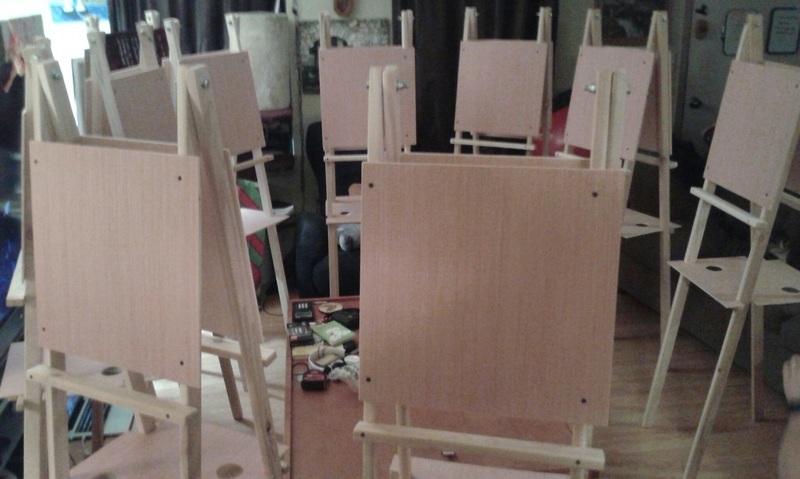 Tonight the last easel was constructed and the time has come to extend beyond what we do alone. All of what is needed to proceed has been prepared, canvases, brushes, paint and such. The hope is to partly fund replenishing supplies through the sale of the art that will continually be made and or by contributions from those participating in the time of worship, solely to be able to continue doing this. So this is the history, the purpose, the plan, and where things currently are. Here's to a life of purpose, joy, love, mercy, healing, freedom, and worship of the God who holds back no good thing from His children. There are often many thoughts and many questions that i don't take the time to voice. After time they settle down and i move on. The ones that don't eventually have to form words or they remain uncomfortable in my own heart. This quote above has been one of those thinking places. I sit with questions of how we define who is broken and who is great. Is it simply based in our own self defined labeling process primarily created to keep us safe and comfortable? Is it based in fame or social economic standard? Or the quantity of things we see in another person that disagree with our own beliefs? What defines greatness? What defines brokenness? I've been wrestling with this for some time. We as humans were created to reign and rule on this planet. The same price was paid for kings, drug addicts, presidents, prostitutes, church members, business owners, stay at home moms etc, to restore us to our rightful place. If the price was the same shouldn't the value be the same? 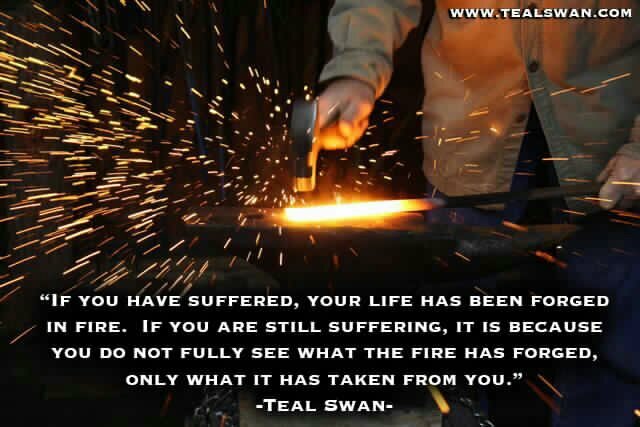 I've seen some of the most amazing people come from the most retched of pasts and horrible situations. So do we simply guess that those born into this societal "greatness" are some how different? How would the world be different if we only saw the greatness people were created for instead of the brokenness were tend to label over people? Maybe brokenness can be better defined by those searching for their role in this great story. How would our own lives be different if we stood up and believed what we really are? It is not humility to live as less than you were made to be. It is not power to see others as greater or lesser. 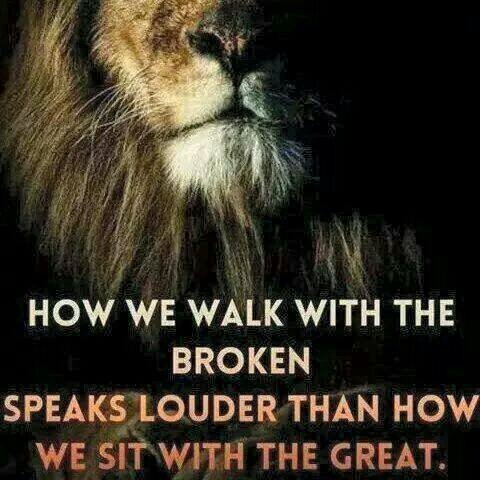 What can we do to call out the greatness in other people instead of this presumed brokenness? How can we walk in our own greatness that God speaks over us today? For we are not struggling against human beings, but against the rulers, authorities and cosmic powers governing this darkness, against the spiritual forces of evil in the heavenly realm. In the deepest thoughts in my mind, I'm acutely aware of human struggling. My eyes see evidence of this in every corner of the world as well as in my own home. Humans wage war with each other searching desperately for someone or something to blame for what has gone wrong. I am no different. If we can just identify the problem well enough then we can find a solution. As if what we can see will give us answers. I'm only beginning to understand that the real problem will remain unseen. Our minds constantly look to visually identify and label what the problem is, then find the correct problem solving flow chart to implement the result into another label of problem solved. Maybe it's just me. Maybe my tendency to define a simple solution. Maybe simply the want of an easy way out. Something rational..... something logical.... something tangible. If only we can identify what we did wrong in places of pain, then it becomes possible to do it differently and imagine how hurt won't happen again. If we cannot identify our own wrongness then someone else must be at fault and we can assign permission to anger as our protection from hurt. We see brokenness everywhere. Pain and people reacting. Either in self blame which causes more destruction or blame placed elsewhere driving continued external destruction. Isn't it strange that either direction adds destruction. We do have an enemy. John 10:10 The thief comes only to steal and kill and destroy; I have come that they may have life, and have it to the full. It is ironic that in trying to identify the problem and who the enemy is, we often end up becoming his partner and continuing his work. It is truly the easy way out to put human skin on enemy actions and play into the destruction. We know this struggle well because the war is often in our own heads. The war resides in our thoughts. Will we choose to live only by what we can see? What we see is just a symptom of the struggle. Focusing on the symptoms never brings healing, it just covers up the problem. We are all in this together. When our minds convince us otherwise we end up on the wrong side by default. We are all struggling to become who we were born to be and we continue fighting a losing battle by fighting amongst ourselves. I will not take the perspective that difficulties, in someone else's struggle in learning to be who God says they are, is the problem. 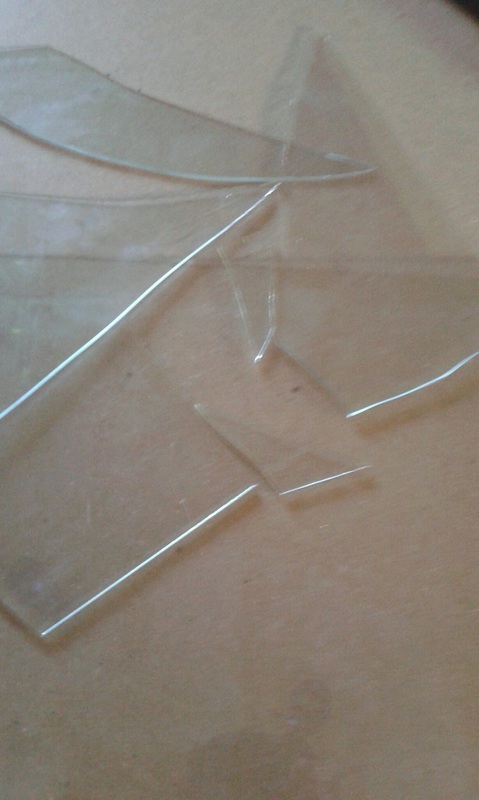 Broken glass is not a sign to label us as broken people. Yes it is a sign of a struggle. It is outward and it is what is seen. It is not a problem. I'm grateful to have different eyes to see. I'm glad for a marker of struggle to replace with love and grace in a simple tangible way. I'm truly thankful for the people in my life who allow me to bear witness to struggle. I'm happy to see an alive world of struggle not carefully masked of in perfectIonism. It allows freedom in my own lack of perfection. It also gives a very clear reminder that through my own imperfectIons I can still be perfectly loved. My fellow humans, we are not enemies to each other even through disagreement. We do not have to continue to agree with the only enemy we have and destroy each other or ourselves. Our struggle is against unseen darkness not against humans who were created in God's image. This is universal not just for those who agree with each other. When we can care more about a person than their behavior or their beliefs, then we can love them well. We don't need to fear what people do or don't do. We don't need to be afraid of the dark. We have a greater force at work within us. How amazing is it to have freedom to simply love people through the struggles. Could this really be a problem free life we've been given? Not to say that living in struggle and the mess of midprocess is easy, but we are free from the condemnation of blame. We are ok even in the horrific mess of living on a planet in major struggle. We already know the end of the story. This gap of struggle is simply finding our role in the middle places of the story, while accepting the grace over our own messy becoming. I'm uncertain to where to begin on this topic. I really am quite fond of being able to make sense of things. I like rational explanations. I like understanding. I often struggle to wrap my mind around ideas that don't make sense in my own logic. I am addicted to certainty. It is a source of comfort for me. : something that is certain : a fact about which there is no doubt. I found it annoying that the root word was contained in each definition. This drew a question in me about whether this was going to end up being a round and round thought process with no point to it whatsoever. Does this mean that even Webster was uncertain about expressing an undefined idea. My biggest issue in my own want for certainty is how much it limits possibility. I very rarely express my thoughts about things I'm unsure of. If my own ideas are not made clear enough to where I believe I'll be understood, I will stay quiet. I would rather express that I don't know than to vulnerably state things that I'm uncertain are true. This poses a problem when I value my own understanding. It creates an even bigger problem when I direct my path based on my understanding. It is sure to lead down some very crooked paths. So I sit and wonder. Where does my need to understand cross paths with God's promise to provide wisdom. And Proverbs 2 adds much more to this thought. So which is it? Is it good to seek understanding and wisdom? Can a person be certain in it? I tend toward looking for tangible evidence when I'm wanting to understand something. It is as if I sometimes view the world through the lense of a scientist. If there is sufficient real life evidence, I can become certain I understand something that is true. In my experience, I have not seen gravity fail as a true concept even though I cannot touch gravity. It isn't necessarily tangible. I cannot touch it or hold it, but I can consistently see the effects and find this consistency creates certainty. This consistency shows up regularly in the laws of nature and my understanding of this leads to certainty in those truths. I am certain that even when the sun is behind the clouds and I cannot see it, that it still faithfully rose in the east every single day. I've seen evidence of God's promises shine into life, yet I do not understand most of the time what God is up to. I've seen sufficient evidence that He is always up to something. Though days go by, sometimes many days, and time gets really long. My lack of certainty drags into wanting to understand. I move back into looking toward my own understanding. I forget that those paths become crooked. I live with big questions and my own small answers. I again turn toward tangible certainty for something to hold on to. Then a passage in Hebrews 6 jumps in. I like the wording in the Message Bible. I wrestle with what this looks like when there are promises that lack no correlating evidence as truth. When it seems impossible to see how some words could look in real life application. What do you do when it doesn't make sense in the place of current existence in life? Does my longing for something certain, something tangible, some thing that makes sense, limit the possibilities in life? To this question, I've had to conclude the answer is yes. 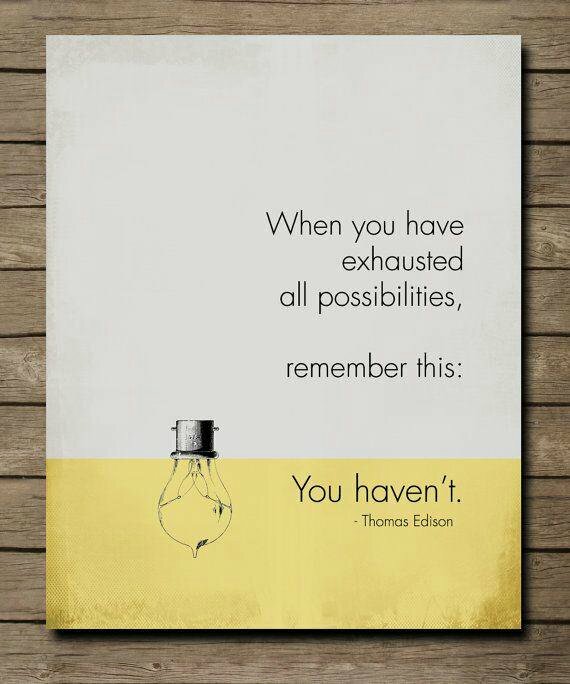 If all possibility were based on my limited understandings, then nothing would be amazing. There would be no wonder, no awe struck moments, no possibility of anything Bigger and better than the current assessment. There would be nothing new to pursue. So the question in me of what is certain and why still lives. Though the very nature in me of curiosity and questioning speaks to this truth. If I only lived in the certainty of my current understanding, my constant questioning would have to cease. Though again returning to the idea that it isn't good to seek my own understanding and base my life on those ideas as facts. Though the regular access to The God who sees all these things and is not bound within my understanding, allows my to seek His wisdom and His perspective. He promises to be generous with these things. So shall I base my certainty on what makes sense to me? Probably not the best plan. I have no desire to have a human size god. Today I think I'll run with my lack of certainty and look at the bigger perspective of what is certain even when my mind lacks the biggness to see tangibly and to make sense of everything. ... today's possibility lives in the place of believing what I cannot see, what I cannot hold and just simply resides in "because He said so. " Maybe just maybe this creates certainty in what doesn't always make sense even though I still grapple with what it looks like and all the big questions. I need a big God for big questions, because my understanding often lives in the world of "it doesn't make sense. "